She stopped me dead in my tracks. Mary Queen of Scots, that is. Her stirring monumental painting hung before me at Blairs Museum and my guide, Danielle Jones, dressed comfortably in an off-white V-neck sweater, with her long brown hair tied back, navigated my journey into Mary’s world of the 16th century. And what a complex world it was—fraught with mystery, intrigue, terror and eventually death by beheading. I really don’t know if I would have had the stomach for such an existence. I could barely manage the scene depicted in the painting if I didn’t have Danielle to explain the symbolism and gory details of this larger-than-life-size canvas. 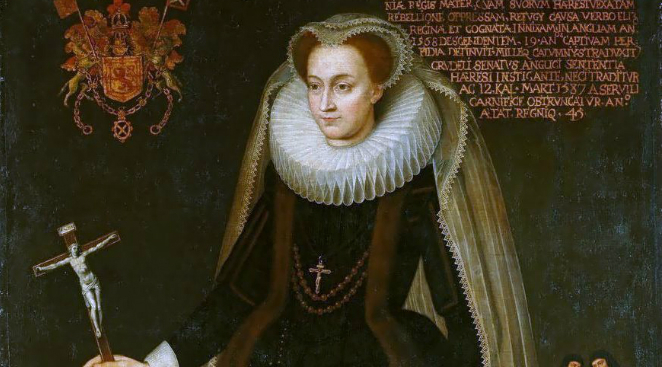 First of all, I learned this Memorial Portrait of Mary Queen of Scots (1542 – 1587) was commissioned several years after her death by one of her loyal ladies-in-waiting. 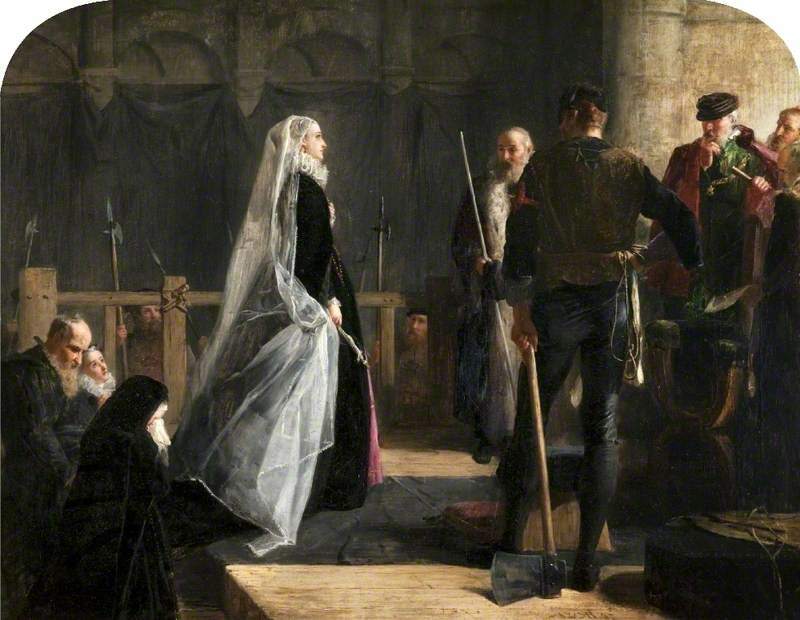 Her name is Elizabeth Cvrle (pronounced Curl) and both she and the other lady-in-waiting depicted in the painting, Joanna Kennethie (Joan Kennedy) witnessed the execution. They appear in a small vignette, in the middle, right-hand side of the large canvas. Mary, who stood nearly six feet tall when she reached adulthood, is pictured in black with a white headdress and delicate veil, cascading to the floor. In this idealized portrait, her red-gold hair frames her outwardly calm, oval-shaped face, betraying nothing of the fate that awaited her. Born in December 1542, Mary’s father, King James V of Scotland, died a mere six days later, making her next in line to the crown after Henry VIII’s children— Edward, Mary and Elizabeth. “What did he die of? Was it natural causes?” I asked Danielle. Against a backdrop of political turmoil churning between England and Scotland, England’s rivalry with France and violence between Catholics and Protestants, Mary was sent to France at age six to be educated in the court of King Henry II. Danielle explained, “Henry VIII wanted Mary to wed his son Edward, and if she had done so, England and Scotland would have been united a lot earlier than it eventually turned out. But her mother, who was Mary of Guise (pronounced Geez), was from French aristocracy, and Mary was then betrothed to King Henry II’s sickly eldest son, Francis II. At the time of their marriage in 1558, Francis was the Dauphin (heir apparent to the royal throne) and Mary, as his wife, became the Dauphine. But not for long! One of Henry II’s great loves, besides his mistress, was jousting. In June of 1559, King Henry, at 40 years old, participated in a tournament lasting several days and during a contest with the young Count of Montgomery, a member of his Scottish Guard, he was struck in the eye by Montgomery’s lance. A long splinter had also pierced Henry’s brain and he died on July 9th of his wound. 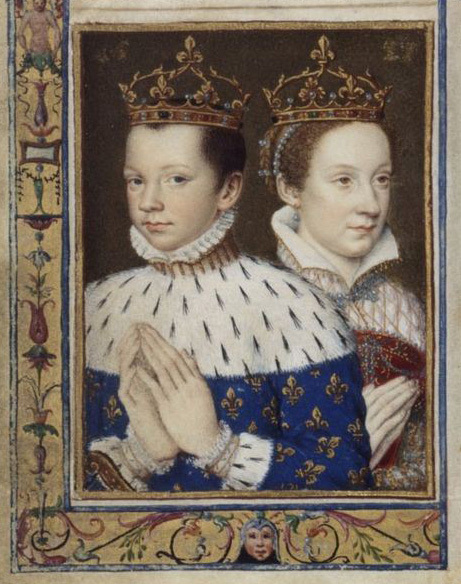 At this point, Francis (age 15) and Mary (age 16) became King and Queen of France. But also not for long! I have to admit, it’s hard to keep all these Henrys straight. I was wondering, how is Danielle able to do it? Considered to be a striking beauty and charismatic, Mary was musically gifted, exceedingly competent in prose, poetry, horsemanship, falconry and needlework. Her French mother, saw to it that she was not only taught French, but Italian, Latin, Spanish, Greek and her native Scots. 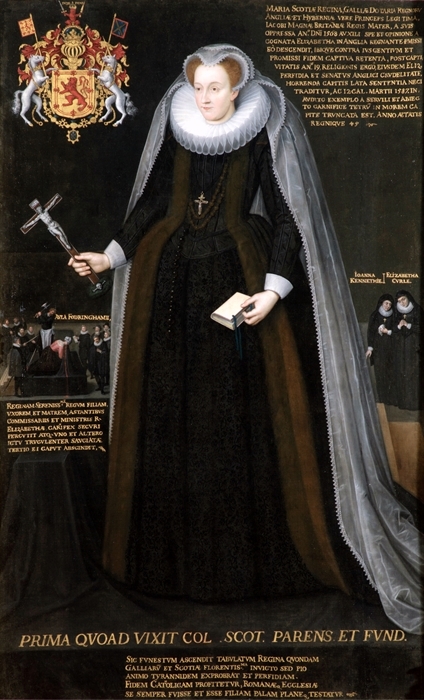 From the time she returned to a Protestant Scotland at age eighteen, as a confirmed Catholic, to the moment she stood on the scaffold, she had been married three times, and endured widowhood, childbirth, forced abdication of the throne to her one-year-old son James, and imprisonment. When she met her death at age 44, having been held in captivity by her cousin Queen Elizabeth for nearly twenty years, she used the stage to make one last dramatic statement. I’m looking at a ghastly scene, with a long stream of blood falling to the floor of the scaffold. “Oh God, oh God. How horrible,” was all I could manage. Danielle had long ago come to terms with the fact that it took three chops of the axe for the incompetent executioner to get his job done, but I felt as if my own blood was draining out of me and it was all I could do to stand upright. I later learned that a large crowd of people had gathered at Fotheringhay Castle to witness the spectacle, and I can only imagine the collective gasp when the executioner swung the axe and Mary’s head was not entirely severed.